Coconut and pineapple are two of my favorites flavors. Put together in sweet little bites, and I am in heaven. 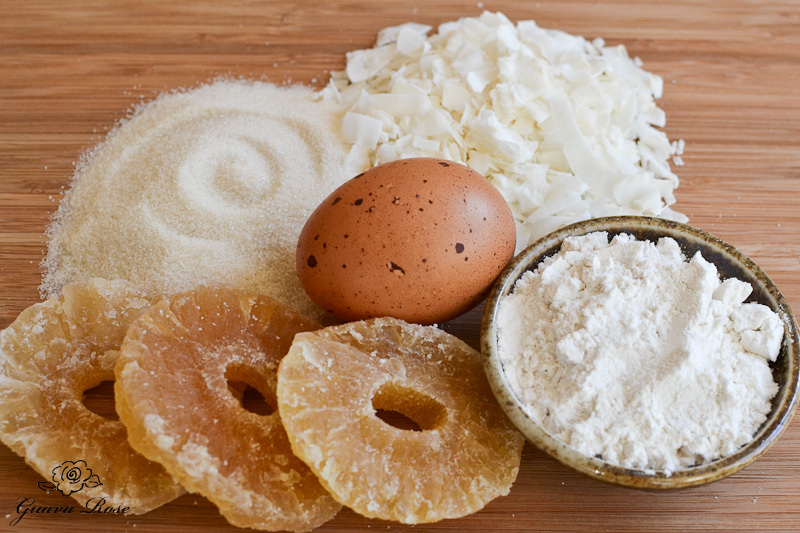 They’re simply made with unsweetened coconut, coconut oil or butter, evaporated cane juice, dried pineapple, an egg, and a little flour. Earlier this week you saw some of them nestled in my Chinese New Year Candy Box. 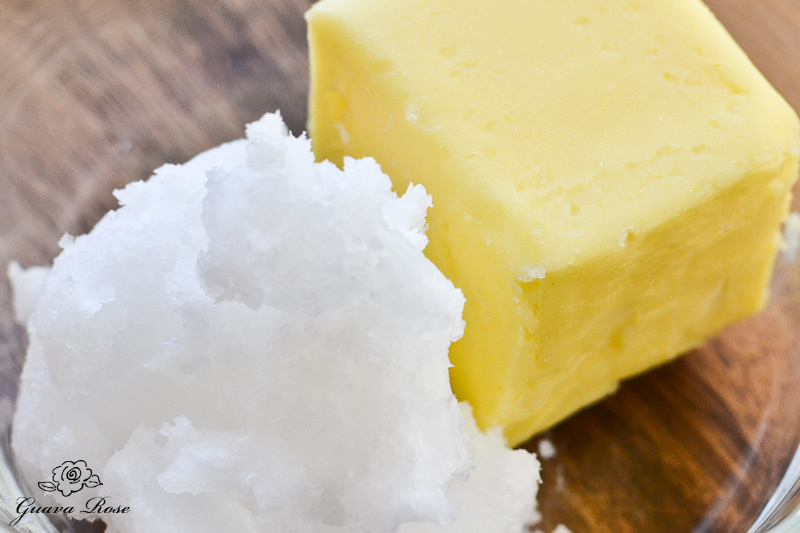 Either coconut oil or butter is fine. I like to use half of each to get the best of both. 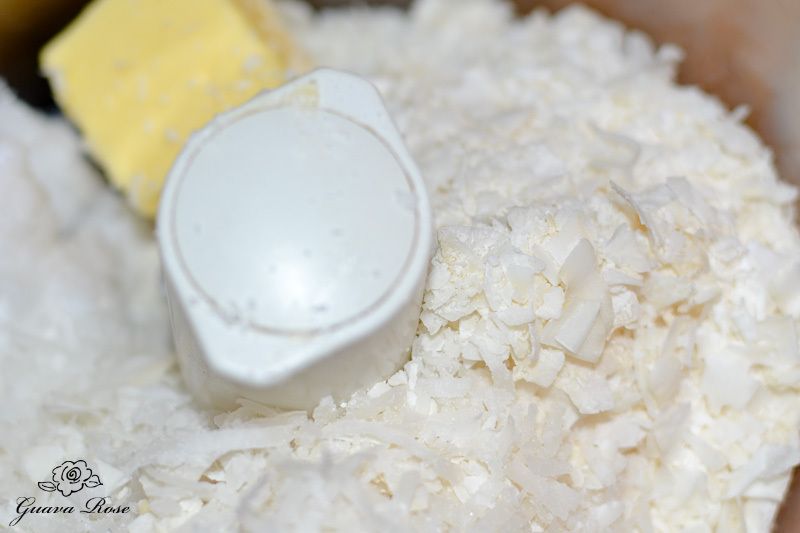 Place the coconut, sugar and coconut oil/butter in a food processor and process until it looks like sand. Add in the egg, flour and salt. Process until the mixture looks like wet sand. It may take a few minutes for everything to fully incorporate. 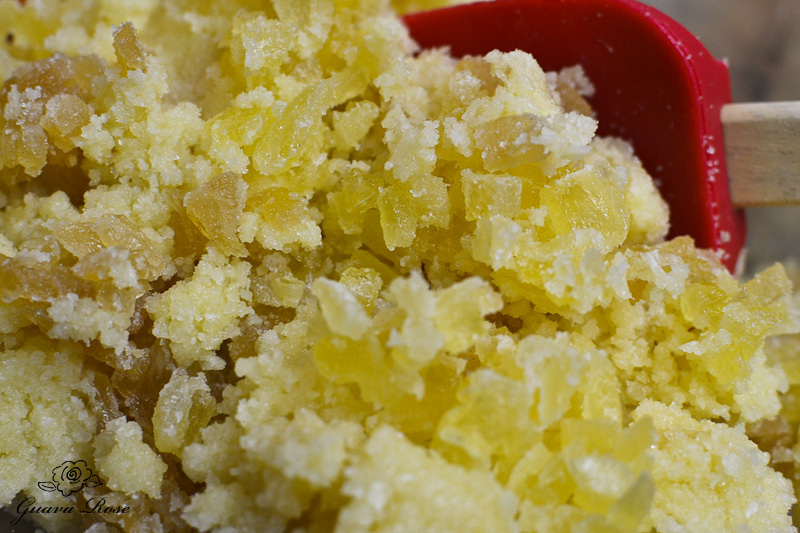 Empty into a mixing bowl and add in some finely chopped, dried pineapple. Mix well and the dough should look like this. 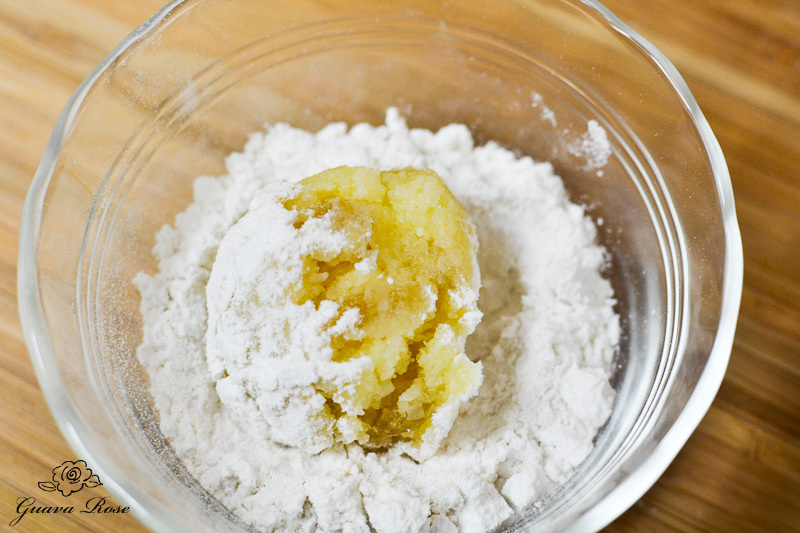 Use a 2 T. cookie scoop to place balls of dough into a small dish of flour. Roll them around to coat them all around. 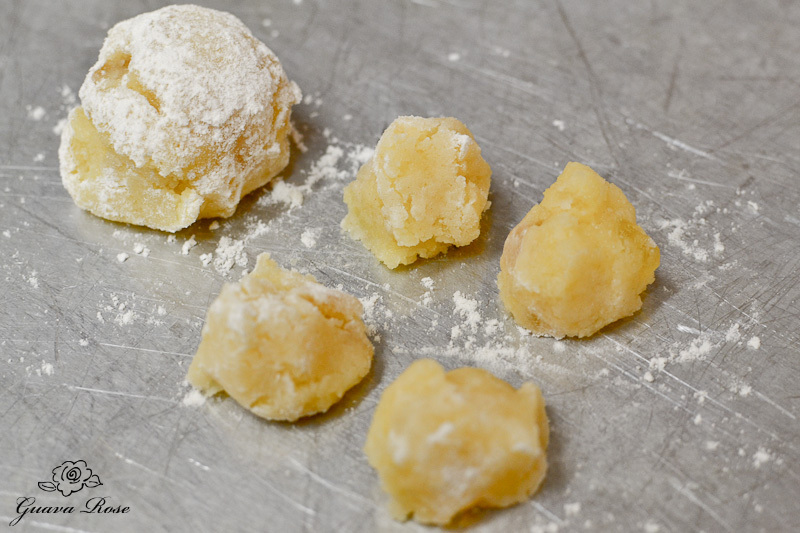 Coating the dough makes it easier when you now divide each scoop of dough into four smaller ball shapes. Spread evenly on a cookie sheet. Bake at 325 degrees for 14-16 minutes, until the bottoms look lightly golden. 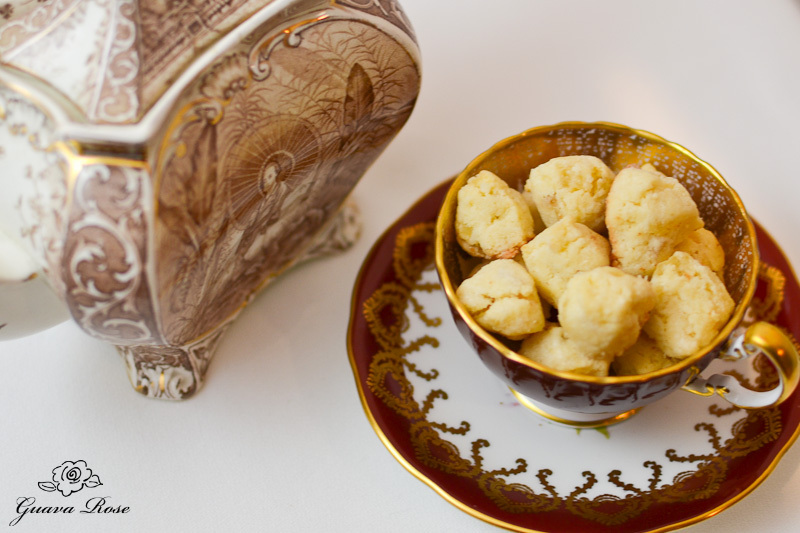 Remove from the oven and immediately turn the cookies over onto their sides or their tops to prevent the bottoms from overbrowning. Cool slightly before eating, if you can wait. A lovely pyramid of sweet sunshine! 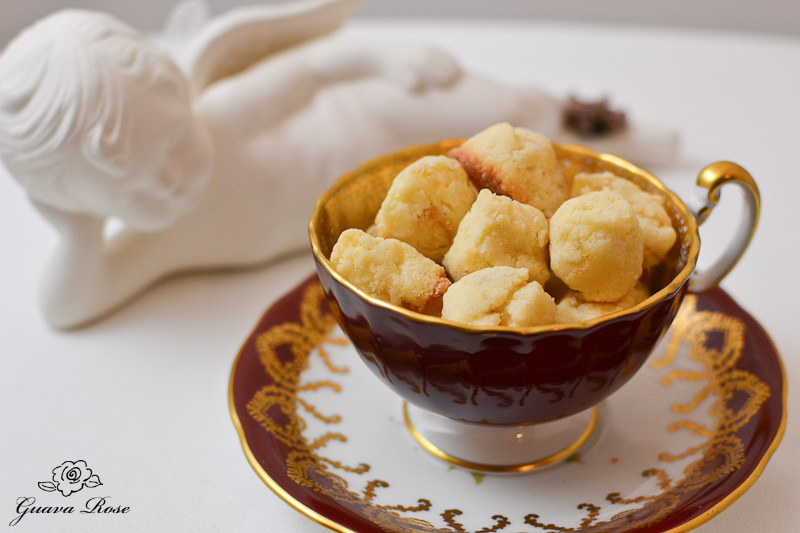 Hmm, well… they kind of do look a bit like tiny scones. How delightful… I think I’ll go make a pot of tea now. 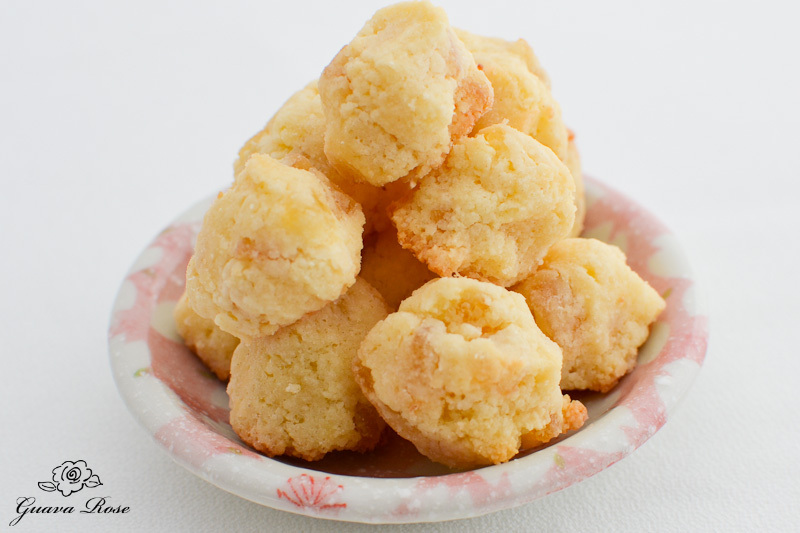 Sweet little bites of coconut and pineapple. 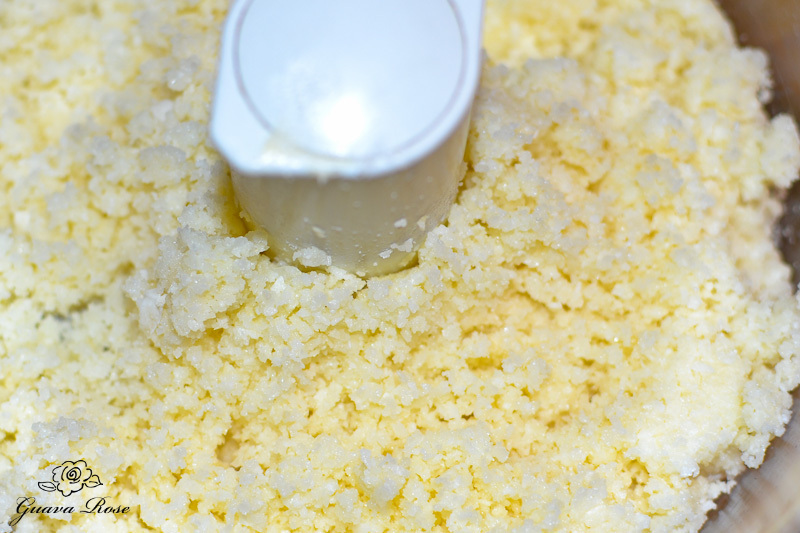 Place coconut, sugar and oil/butter into a food processor. Process until mixture looks like sand. 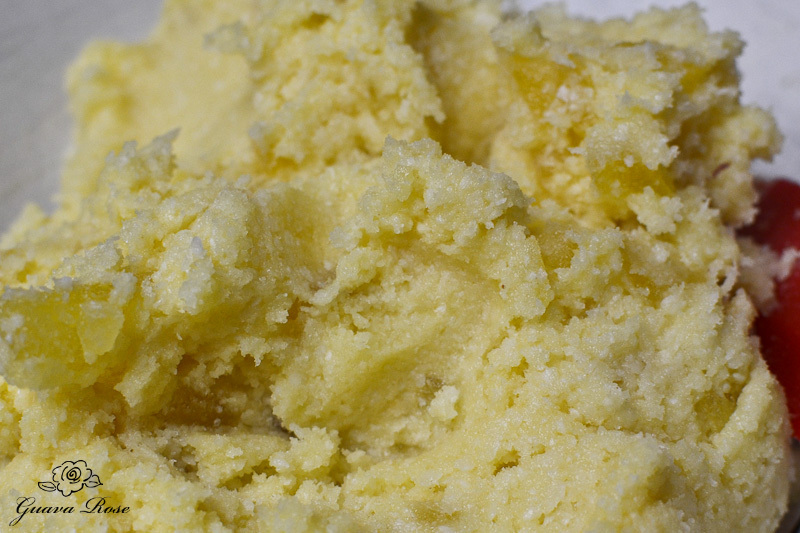 Add egg, salt and ¼ c. flour. Process again to blend well. It should now look like wet sand. Remove to a bowl and mix in pineapple. Use a 2T. cookie scoop to scoop balls of dough. Roll balls one at a time into a small bowl with the remaining 3T. of flour, coating all around. 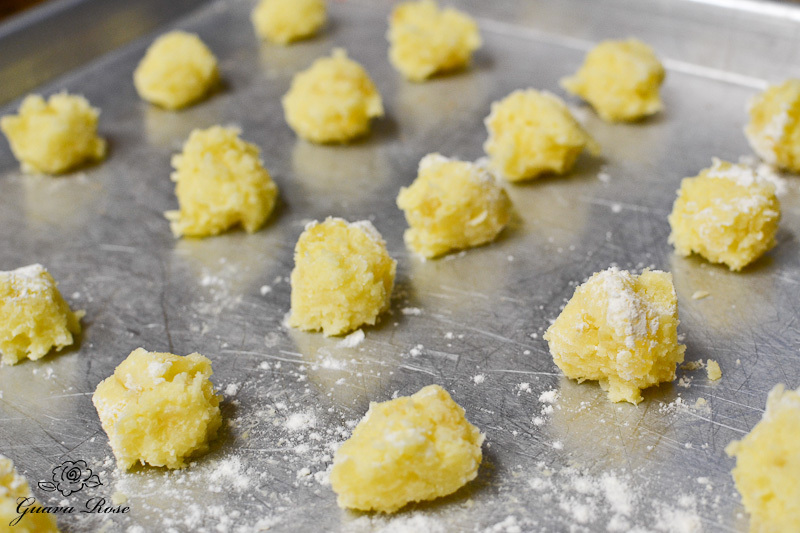 Now divide each flour coated ball into 4 smaller balls and place them evenly spaced apart on cookie sheets. 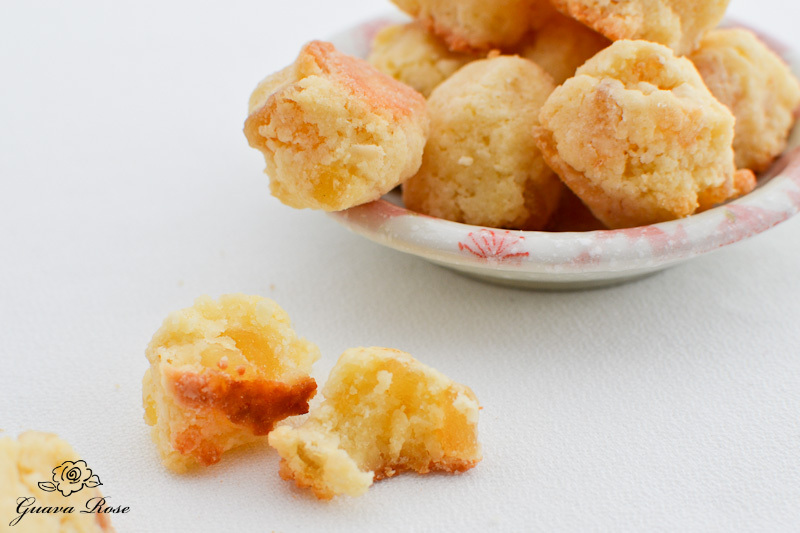 Bake for 14-16 minutes, until the bottoms are lightly browned. 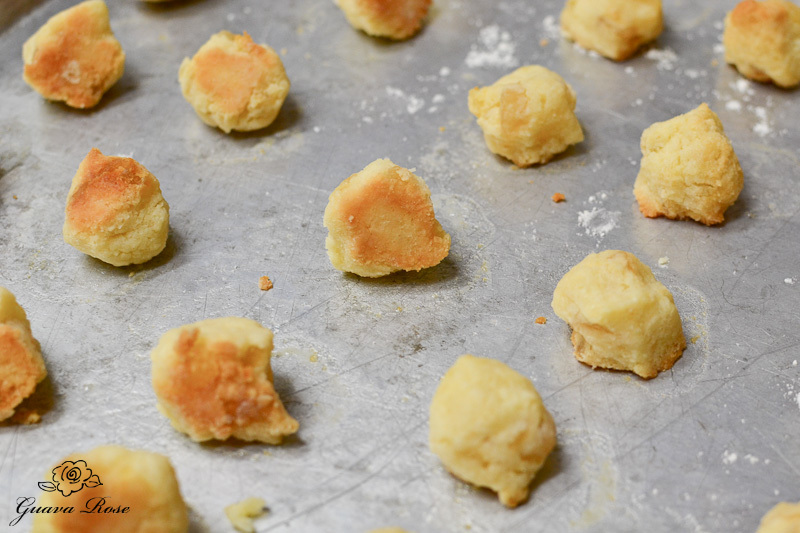 Remove from oven and immediately turn cookies over onto their tops or sides to prevent the bottoms from overbrowning. Cool.